Why does New Zealand tolerate either of these murderous regimes? NAY PYI TAW, March 26-- Li Changchun, a senior official of the Communist Party of China (CPC), met with Than Shwe, chairman of the Myanmar State Peace and Development Council (SPDC), here on Thursday, during which they exchanged views on developing good-neighborly and friendly ties between China and Myanmar. 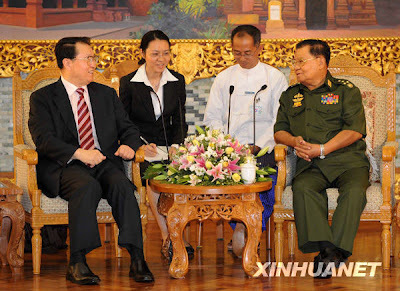 Li, a member of the Standing Committee of the Political Bureau of the CPC Central Committee, was on a visit at the invitation of the Myanmar government. Li conveyed greeting from Chinese President Hu Jintao to Than Shew in the meeting. "China and Myanmar are good neighbors, friends and partners, and the China-Myanmar friendship, which was built on the basis of Five Principles of Peaceful Co-existence, has withstood the ordeal of time and the changes in the international situation," Li said. He described the features of China-Myanmar ties as "mutual respect, equally treatment to the other, mutual trust and sincere cooperation." Bilateral ties scored new progress after the ardent of the new century with frequent high-level contacts and increasingly mutual trust in political areas, he said, adding that the two nations also collaborated with the other in regional and international issues. The development of good-neighborly, friendly and cooperative ties with neighboring countries constitutes an important part in China's foreign policy. "As friendly neighbors and developing nations, China and Myanmar face similar tasks of development. We should seize the new opportunity to develop bilateral ties under the complex international situation," he said. He urged both to push forward concrete cooperation. China encourages the Chinese enterprises to carry out mutually beneficial cooperation with Myanmar in energy and resources, infrastructure, agriculture, industry, mining and telecom sectors, he said. Li also highly spoke of the progress made by Myanmar on political construction, national reconciliation, economic development and the improvement of people's life. Than Shwe commended China's socio-economic achievements. Myanmar is one of the first countries which recognized the new China after its founding in 1949. "The people of Myanmar is proud of this," Than Shwe said, adding that "the further growth of bilateral ties comply with the fundamental interests of both." He reiterated that Myanmar supports China on issues related with China's core interests. One of the biggest mistakes the U.S. ever made was to recognize China as a legitimate nation.